Steve H. Hanke , professeur d’économie appliquée à l’Université Johns Hopkins, est Senior Fellow et directeur du Projet des Devises Troubled au Cato Institute.Steve H.Hanke est un économiste américain connu pour son important travail sur les tableaux de change, la dollarisation, l’hyperinflation, et d’autres sujets en économie appliquée. Q: Since the start of the Eurozone crisis, member states in the so-called “periphery” of the common currency area have focused on fiscal austerity and structural reform as a means to restoring debt sustainability. Will these steps be enough to stabilize their sovereign debt markets? A: No, I don’t think so. Member states haven’t delivered on much in terms of fiscal austerity and certainly not structural reform. Fiscal austerity should be about reducing the size of government… governments are bloated and spending way too much in Europe. Austerity should be almost entirely focused on reducing government expenditures and obviously not on increasing taxes. But there’s a lot of tax increase noise within the so-called austerity programs in Europe, so they just have it all wrong. And, in any case, they haven’t delivered much. As far as structural reforms go, there have been almost none that have actually been implemented, even in Greece. They’ve talked a lot, and spent most of their time blaming markets or the outside world — the Germans, the Dutch, the Finns, and so on — for the problems that they’ve gotten into. So there’s a lot of finger pointing going on and talk about structural reforms, but they’re half-baked. And when I say structural reforms, what do I mean? What they have to do is put in place growth-friendly policies and get government out of the way. And that means they have to have something like Presidents Reagan and Clinton did in the United States; they have to reduce government expenditures and reduce regulation and red tape. But they’re not in that business in Europe. Their assessment is: we have a crisis because markets failed and we have to regulate markets more now so that they don’t fail in the future. This is just upside down because the crisis was caused by government failure — mainly the European Central Bank and the Federal Reserve Bank of the United States. These were the great enablers and engines that allowed for the blow-up of the bubble that ultimately burst in the fall of 2008, although there were problems in Europe even in the summer of 2007. So essentially in both the fiscal austerity and structural reform realms, the packages that they’ve been talking about are really almost fatally flawed. And they haven’t even delivered on what they said they would deliver on in the first place. They’ve been wasting their time moving from one meeting to the next and jumping from one fire to the next. They lack the “vision thing.” The long and the short of it is: will these steps toward fiscal austerity and structural reform stabilize the periphery’s sovereign debt markets? The answer is: of course not. 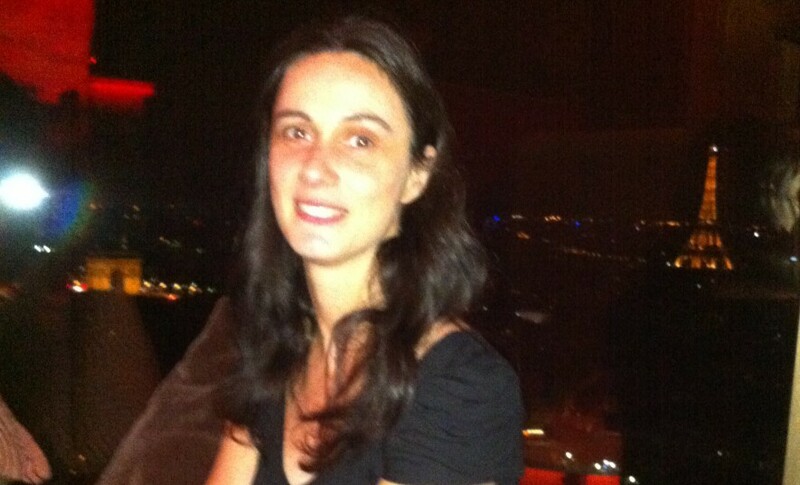 Q: How do you see the crisis evolving in the periphery and the Eurozone as a whole? A: Well, we have a problem here, and it’s the following. We just had a restructuring of Greek debt, and we’re getting the so-called second bailout coming into Greece. To some extent, the political elites are breathing a sigh of relief because there wasn’t an explosion that went off. And they’re moving on to electoral campaigning in both France and Greece — they’re now in full election mode. 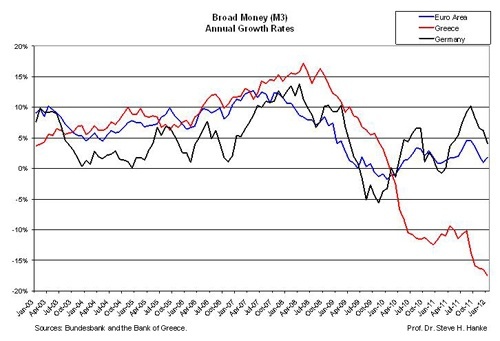 But if you look at Greece, the money supply there is contracting at a fantastic pace — over 16% per annum. So Greece’s economy is going to implode. All the calculations about debt sustainability and other things they’re talking about… you can just throw them into the garbage can. None of them are going to come true because the Greek economy is going to continue to shrink dramatically — you can just see it in growth and the broad money measure (M3). The point here is that money matters, money will dominate; forget the fiscal austerity packages and structural reforms. Money in the short-run will completely dominate the economy. So there are huge deflationary forces at work right now in Greece and as I’ve said since February 2010, the Greek economy is on an implosion course. Now, where do we go from here? We are set up to have a real collision. It will ultimately occur and there will be a lot of tension along the way. That is, the political elites view the euro as a political project to unify Europe. On the other hand, we have the economic realities of the Eurozone in which the southern countries have become very uncompetitive for a variety of reasons. Mainly, there have been a lot of wage increases in the public sector and, on top of that, Italy has a somewhat unique situation because, since it adopted the euro, there have been essentially no productivity increases. So not only have they had wage increases, but no productivity increases. They’re very uncompetitive in all those southern tier economies. In the coming decade, economic forces will congeal to get the system back to equilibrium — and this isn’t a policy thing, it’s just the nature of the monetary union. The Eurozone will move in the direction of equilibrating itself and will get the southern countries to be more competitive or on some kind of par with the northern countries; you will have relatively high inflation in the north and deflationary pressures in the south. That’s one scenario, and it’s the most likely economic reality that will evolve. But of course this will mean that that economic reality will be on a collision course with the political elite. High inflation in the north and low inflation, or deflation, in the south is a formula for continued problems and anxieties in both the north and the south. So the elite will try to do bailing out, patching up, band aids, you name it… but of course it’s going to cost the taxpayers in the north a lot. So it won’t be very popular with the average working man who has to pay taxes, but that is what the political elite will try to do. In my view, they will continue to distribute bailouts even if there’s moral hazard and all the rest of these dangerous implications. The political agenda is set, and it’s to have a unified Europe. This is going to run into a buzz saw of economic realities that are largely driven by deflationary forces in the south and inflationary forces in the north. Q: Is there still a heightened risk of contagion from Greece or other periphery countries to Eurozone financial institutions and “core” economies? A: Yes, there’s no question about it. Greece in a few months could be the verge of blowing up again because the economy is imploding, which I think will happen and the markets do too. Markets have priced in this new debt that has been swapped for the old debt at very low rates. The market clearly doesn’t think they’re going to be paid. So market participants, with their own money at risk, think there’s a high probability that Greece will not pay and I completely concur with that. Only I think it’s probably going to be worse than the market thinks. Q: European leaders have agreed to a wide range of measures aimed at promoting fiscal sustainability and addressing macroeconomic imbalances. Do you think these steps will accomplish their goal of preventing a repeat of the crisis? A: No, I think the agreements aren’t worth the paper they’re written on. It’s like the Maastricht Treaty, which was broken almost immediately by France and Germany. When it comes to treaty infractions, I don’t know if the “police” would pick up the wayward parties. And I’m almost certain that there would be no prosecution, in any case. I think the whole system… and I’m not talking about the euro itself because the euro itself isn’t really the problem, and never has been the problem. The whole system, and the whole grand structure integrating Europe has been turned into a set of rules and treaties and so forth that has essentially morphed into a kind of doomsday machine. Q: Prior to the crisis, many perceived the euro as emerging alternative to the dollar as an international reserve currency. Could the euro reprise this role and even become more attractive than it was prior to the crisis? A: There has always in world history been a dominant world currency. The U.S. dollar happens to be the dominant currency now, and it’s always very hard to challenge the top dog. The life of a dominant currency on average — and this is going back about 2,700 years — is about 300 years. So this would suggest that the U.S. dollar is probably, in statistical terms, going to be in the saddle for a while longer. That said, of course, today it’s always relative — one unattractive currency against even more unattractive currencies. So, if U.S. monetary policy stays as bad as it’s been since 2003, and the world retains the kind of international non-system that we have, I think the U.S. dollar is somewhat vulnerable. But the problem is, who are the challengers? They talk about the euro, but the Eurozone is an economic basket case. And then you’ve got the Chinese yuan; some people are talking about that, but the Chinese yuan isn’t even a convertible currency yet. Even the Russian ruble is convertible. You can’t challenge a dominant currency with an inconvertible one. So, I think in the foreseeable future there’s a lot of conjecture and musing about the dollar’s international role, but I think we’re stuck with the dollar. Q: Would the introduction of Eurobonds change this assessment? A: Eurobonds for the euro area as a whole would probably enhance the euro and make it a more viable challenger. Now, whether it’s a wise idea or politically even feasible… those are another set of questions. But given the question you asked, my answer is that a Eurobond would enhance the international role of the euro. Q: Do you think an intermediate step toward a Eurobond, such as closer fiscal coordination or limited fiscal integration would still have that effect? A: I doubt it. The credibility of European economic policy, policymakers, and European elites is so low that any kind of intermediate step would be frowned on and not taken very seriously. I think they would really have to do the real deal. And that gets back to my first point about fiscal austerity and structural reforms in Europe. They’ve done almost nothing, especially with structural reforms. There have essentially been no structural reforms to liberalize the economies in Europe and take some of the red tape and intervention out of the system. I just don’t see that vision in Europe. The only place that we saw that was in Germany under the Schroeder government. Schroeder pushed through reforms and liberalized the labor market. And that’s one reason the German engine is humming along, because of Schroeder’s Agenda 2010 program. It may be possible elsewhere — I don’t want to be completely negative here. But I don’t see that kind of talk and initiative on the horizon in Europe. Q: Do you see the Eurozone crisis affecting the U.S. recovery over the next year? A: There is one scenario that is very ominous for the United States, and that’s if Greece blows up and things are thrown out of kilter in Europe. Then, Europe’s growth would really go into negative territory and the U.S. dollar would soar. If the U.S. dollar soars like it did after the Lehman blow up… actually from July 2008 until February 2009 the dollar went up almost 30% against the euro. That huge strengthening dollar meant that commodity prices collapsed and things were very unstable as a result. If you’re getting into that kind of scenario, it would be good for people holding dollars, bad for commodity prices, and probably bad for the U.S. economy. So it’s conceivable that Europe could throw up a lot of dollar-euro instability and that’s bad. On March 3, 2014, the United States went to war with Russia. That’s when the U.S. first imposed sanctions. And, yes, sanctions are nothing more than war by non-military means. Then, on November 11 Russia committed a major misstep. It floated the ruble. 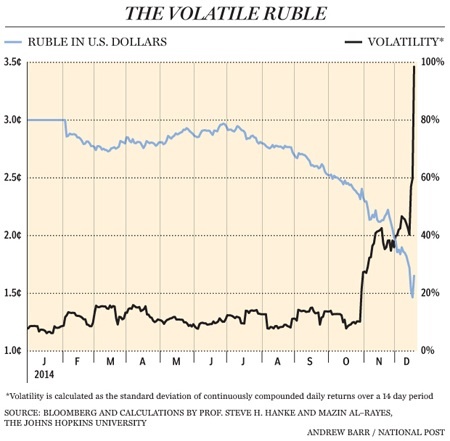 Since then, the ruble hasn’t floated on a sea of tranquility. It has plunged in lockstep with oil — by about 25% and its volatility has soared to around 65%. The ruble’s plunge means that Russian imports will be more expensive and exports more competitive. This combination will help keep Russia’s current account positive, which will offset some of Russia’s massive capital flight. In addition, Russia’s fiscal accounts are denominated in depreciating rubles and its oil exports are invoiced in appreciating U.S. dollars. So, the fiscal blow from lower oil prices will be cushioned by a weak ruble. But, there are limits to any temporary benefits from a ruble rout. When a currency takes a dive, the specter of inflation is always right around the corner. How can Russia avoid further damage and correct for its error of November 11? Russia should abandon the floating exchange-rate regime, which it adopted on November 10. Oil and other commodities that Russia exports are priced and invoiced in U.S. dollars. By embracing a floating exchange-rate regime, Russia is inviting instability. The ruble’s nominal exchange rate will fluctuate with oil and other commodity prices. When the price of oil rises (falls) the ruble will appreciate (depreciate), and Russia will experience a roller-coaster ride distinguished by deflationary lows and inflationary highs. To avoid these wild rides, most of the big oil producers — Saudi Arabia, Kuwait, Qatar and the United Arab Emirates — link their currencies to the U.S. dollar. Russia should do the same. To get things right, Russia should lift a page from John Maynard Keynes’ Russian playbook and establish a currency board. Under a currency board system a central bank issues notes and coins. These are convertible into a foreign reserve currency at a fixed rate and on demand. As reserves, the monetary authority holds high-quality, interest bearing securities denominated in the reserve currency. Its reserves are equal to 100 per cent, or slightly more, of its notes and coins in circulation, as set by law. A central bank operating under a currency board rules does not accept deposits and it generates income from the difference between the interest paid on the securities it holds and the expense of maintaining its note and coin in circulation. It has no discretionary monetary policy. Instead, market forces alone determine the money supply. There is an historical precedent in Russia for a currency board. After the Bolshevik Revolution, when troops from Britain and other allied nations invaded northern Russia, the currency was in chaos. The Russian civil war had begun, and every party involved in the conflict was issuing its own near-worthless money. There were more than 2,000 separate issuers of fiat rubles. To facilitate trade, the British established a National Emission Caisse for northern Russia in 1918. The Caisse issued “British ruble” notes. They were backed by pounds sterling and convertible into pounds at a fixed rate. Kurt Schuler and I discovered documents at the archives in the British Foreign Office which prove that the father of the British ruble was none other than John Maynard Keynes, who was a British Treasury official at the time. Despite the civil war, the British ruble was a great success. The currency never deviated from its fixed exchange rate with the British pound. In contrast to other Russian rubles, the British ruble was a reliable store of value. Naturally, the British ruble drove other rubles out of circulation. Unfortunately, the British ruble’s life was brief: The National Emission Caisse ceased operation in 1920, after allied troops withdrew from Russia. Yes, it is time for Putin to lift a page from Keynes and follow what most large non-U.S. oil producers already do: link the ruble to the greenback.